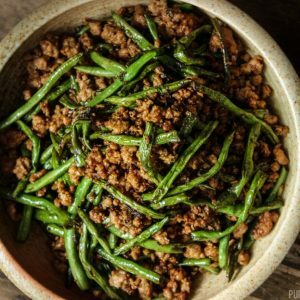 A simple dry-fried long beans and minced pork dish seasoned with umami packed Chinese olive vegetables. Flavorful, quick and goes great mixed with rice for a quick meal. Now that Summer has come and gone in a blink of an eye and I’m finding that I am rushing to complete all the summer projects I have been meaning to complete but never had a chance to tackle this year. You ever feel like there’s not enough time in the day – ever? 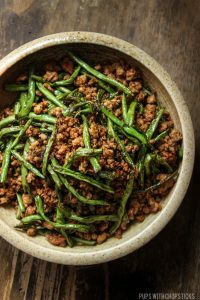 For this dry-fried long beans recipe, most of these ingredients can be found at your local grocery store with the exception of maybe yardlong beans, chinese olive vegetables and chinese rice cooking wine which can be found at a Asian grocery store or online. 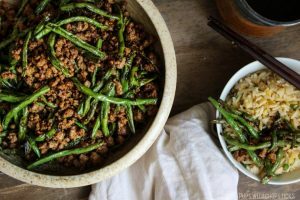 If you can’t find yardlong beans (Chinese long beans), you can easily substitute this with green beans. Chinese rice cooking wine can also be substituted with dry sherry. White pepper cannot be substituted with black pepper, it is a totally different flavour. White pepper is much more mild in flavour compared to black pepper. If you don’t have white pepper, you can omit this. Chinese olive vegetables is a interesting umami packed condiment made from olives, mustard vegetables, oils and salt. It tastes very different than the typical olives and is also used differently. You can read more about it here. 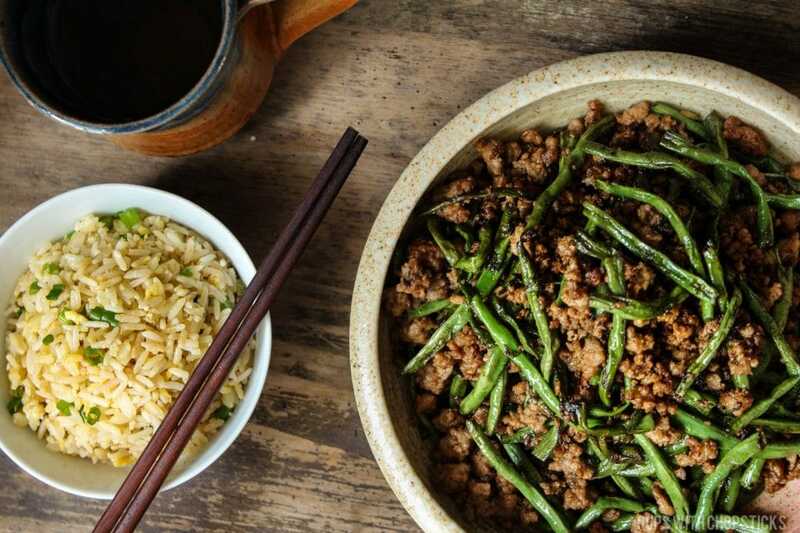 If you are using Chinese long beans for this recipe, you will have to cut it up as having them whole is a bit unwieldy, unless you mastered a technique to slurp long string beans – in that case, please share! Cut off the tips, those are woody and then chop the rest of the beans up into smaller to eat pieces. This is a simple recipe. 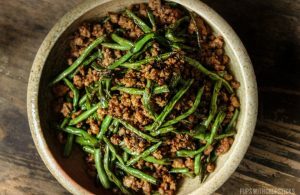 The only thing out of the ordinary is that you will have to remove the minced pork once it is done cooking, so you can give the beans a fresh hot wok to blister in – and so you don’t overcook and burn the pork while you’re working on the beans. To par-boil or not to par-boil? That is the question…. I know I was pressed for time but I can’t refuse a good experiment. 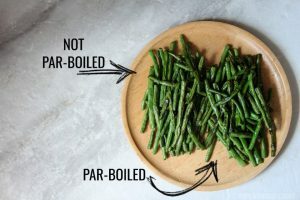 I have heard from many sources in the past that par-boiling your beans before stir frying them keeps them greener and cooks them faster so I decided to test this theory to see if it is truly worth the extra step. My findings? I didn’t find that it kept the beans greener but I have to agree that it did cook faster – which makes sense since I already cooked it. Duh Joyce. 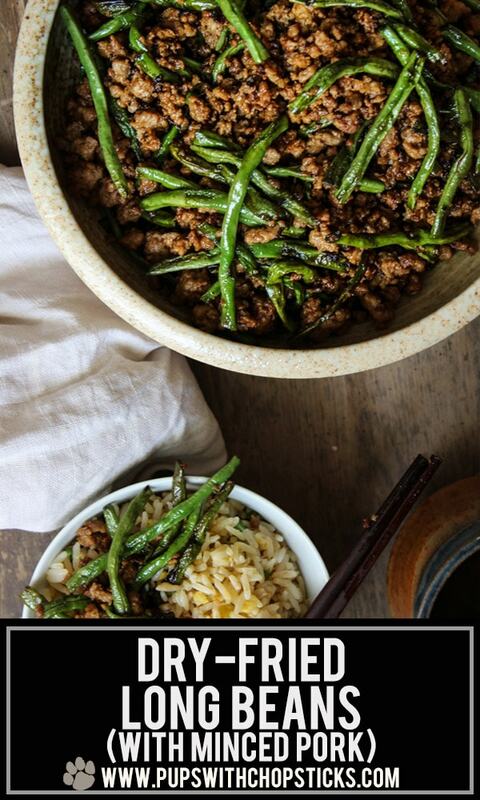 To me, dry fried is just a fancy way of saying stir fry in a pan with REALLY hot oil. That’s essentially what it is. You’re using really hot oils in a pan or wok and then cooking the foods really fast on this really hot oil to cook the foods really fast. When you are dry frying, you need to work fast, keep the food moving and work with small bite sized pieces. Usually when you dry fry something, you start off the frying by by browning some ginger and garlic to flavour the oil before adding in the veggies or meat. 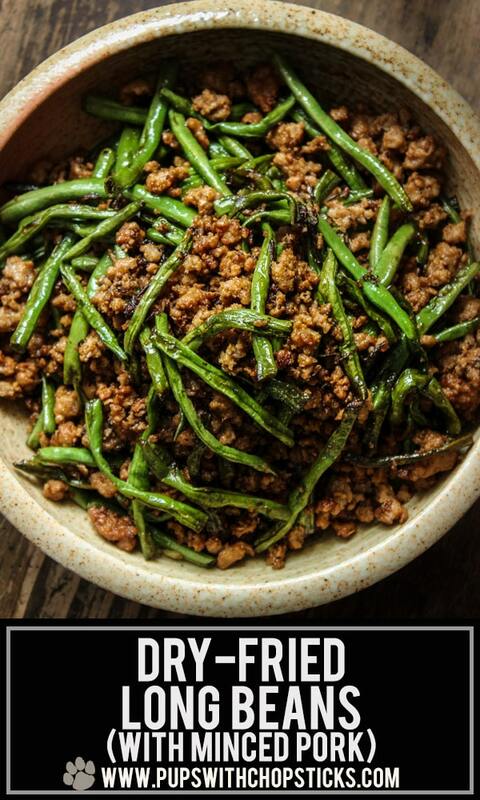 Simple dry-fried long bean & minced pork dish seasoned with umami packed Chinese olive vegetables. Delicious mixed with rice for a quick and flavourful meal. Wash the beans under cold water and cut off the ends. 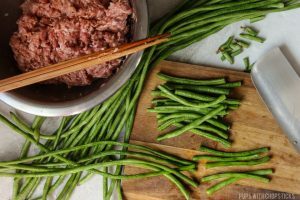 When the pork is done, stir in the dark soy sauce and mix well and pour out the meat into a bowl and remove the ginger slices. Set aside the meat for later. Re-heat the wok or frying pan on medium high to high heat with 1-2 tablespoons of oil. Hi Joyce, I was indeed wondering what to do with the rest of the olive vegetable. Thanks for the tip about fried rice. 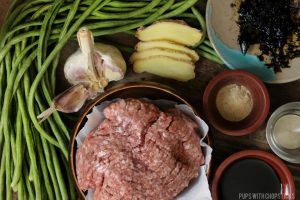 I wonder if your yummy recipe would work as well for string beans. I’m glad you didn’t mind my mentioning the typo! 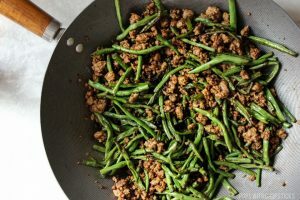 I finally got all the ingredients together so I could make this recipe for Dry-Fried Long Beans and Minced Pork with Olive Vegetable. My garden produced a bumper crop of long beans this year and I’m glad I now have a tasty way to prepare them. (There is a confusing typo in the recipe. It says “finely mince the ginger” where it should say “finely mince the garlic.”) The amount of soy sauce seemed a lot but it balanced very well. Thank you, Joyce! this with an obscene amount of rice on the side sounds perfect! also yes, all those languishing summer projects sigh. i was going to try to compile a family e-cookbook (we have one but it’s old and on paper)…. and that still hasn’t gotten started. whoops. Off to the store I go to find Chinese olive vegetables! This looks sooo good! Hey, Joyce! This is so appetizing! It’ll probably be my next favorite meal! Such a good post Joyce. I learned a lot. Never knew that you have to remove the meat first before putting the veggies in to cook the veggies faster. I will try that for my next stir-frying session. Wow that looks so good. Would like to make a vegetarian version of this recipe for dinner soon. Thanks for sharing. Looks so good. Love green beans. Pinning for later. Yum! Such a wonderful weeknight meal. My family would love this. Thanks for including the difference between par-boiled beans and breaking down the steps. I’m so intrigued by the olive vegetables! They sound delicious! OMG those beans look incredible! 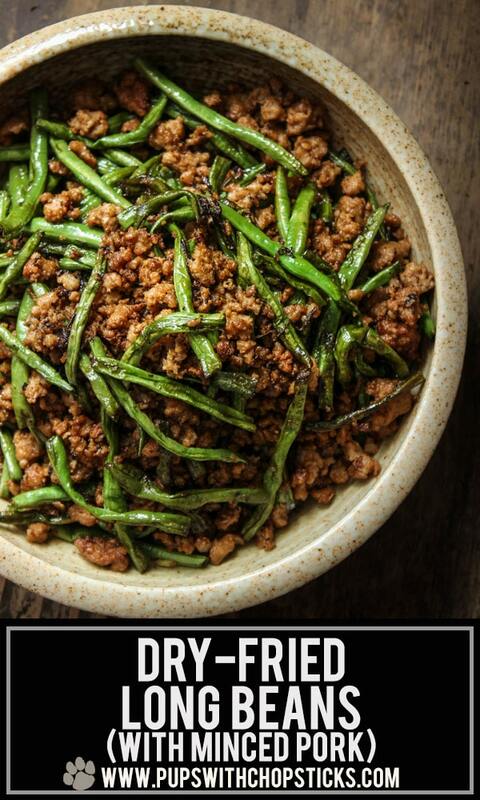 I didn’t know what dry frying meant – thanks for explaining!